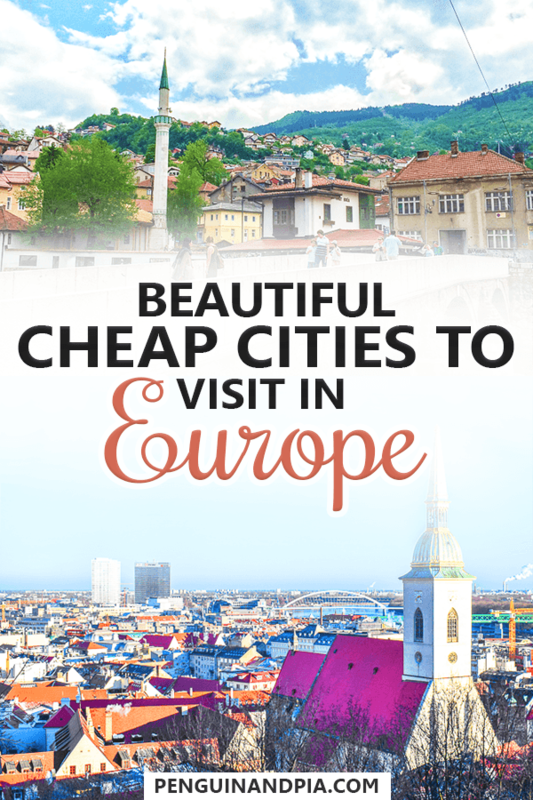 Check Out These Cheap Cities To Visit In Europe! There are some great cheap European destinations you can check out. Whether you are looking for a cheap holiday or a short visit full of adventure, food, culture, and nature – you will certainly find a few cheap places to visit in Europe. We’ve been lucky enough to have visited a bunch of the cheapest cities in Europe. We didn’t actually intend to visit only cheap places – it just kind of happened that way when we travelled around early last year. We are SO thankful that we did. Now, we know quite a few interesting places to visit in Europe (that we think many people miss) and are happy to share our experience with you! For this list, we have brought together mostly places we have been to – and a handful we are dying to travel to. So let’s walk through some amazing – and cheap – cities to visit in Europe! Parts of the old town in Sarajevo are beautiful. 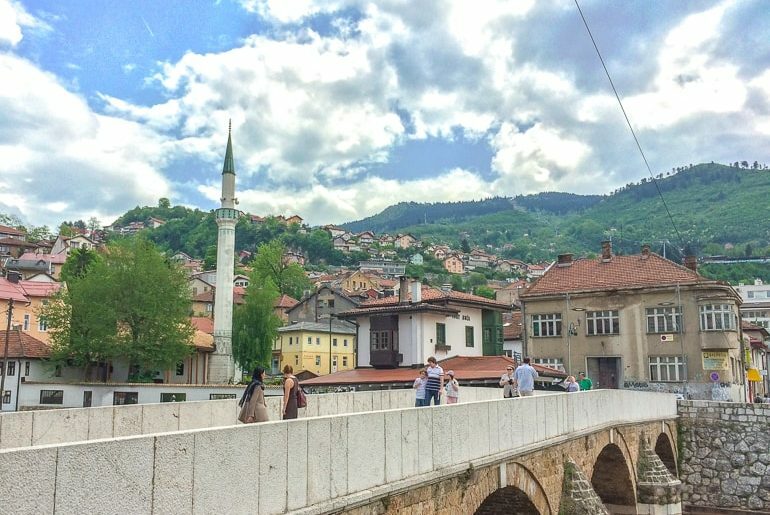 If you want a cheap European city to visit, you have to check out Sarajevo. The capital of Bosnia and Herzegovina is full of history (good and very dark) and we had an amazing time exploring it. The city is divided into two main parts – the new part which is very Austro-Hungarian and the older Ottoman Old Town Bazaar area. You should explore the food and culture in both – it’s definitely worth it. Overall, the city was safe, very culturally diverse, and also full of scars from decades ago. We did a historic walking tour to learn all about the Balkan wars and we are glad we did. If you want to get to Sarajevo, you can fly into the city pretty easily. Since we were already in Croatia, we got to Sarajevo from Split, Croatia by bus and it’s a pretty simple drive. You can read about things to do in Sarajevo and some of the best restaurants in the Old Bazaar. To start your journey: You can get started looking for accommodations in Sarajevo here and hostels in Sarajevo here. Our guesthouse was only 33 Euro for a private room (for both of us) with shared washroom for 3 nights! The Palace of the Parliament is a massive sight to see and tour. If you want to check out more of Eastern Europe, we’d suggest heading for Romania. This EU country is beautiful, full of culture, and definitely priced at a point that is easy on the wallet. We had the chance to stay in the central city of Brasov which we loved (and it was also pretty inexpensive). As for other cheap Romanian cities, the capital city of Bucharest definitely fits the bill. We got to wander about and check out the old town area as well as the Palace of the Parliament. We were told that the nightlife in Bucharest is pretty wild – but we didn’t get the chance to find out. Also, it was a pretty cheap Uber from the city centre to the the airport. Romania uses the Romanian Leu – and at the time the exchange was 1 Leu to .20 Euro. Eric always measured how cheap a place was by the price of a can of beer. A “tall can” of beer in Romania was like 90 Canadian cents – so that’s fairly cheap. We also had a massive lunch at Excalibur (touristy but still really good) and with drinks and tip it was only 9 Euro/person. If you are looking for things to do in Bucharest, we kind of got rained out but managed to see a few things! 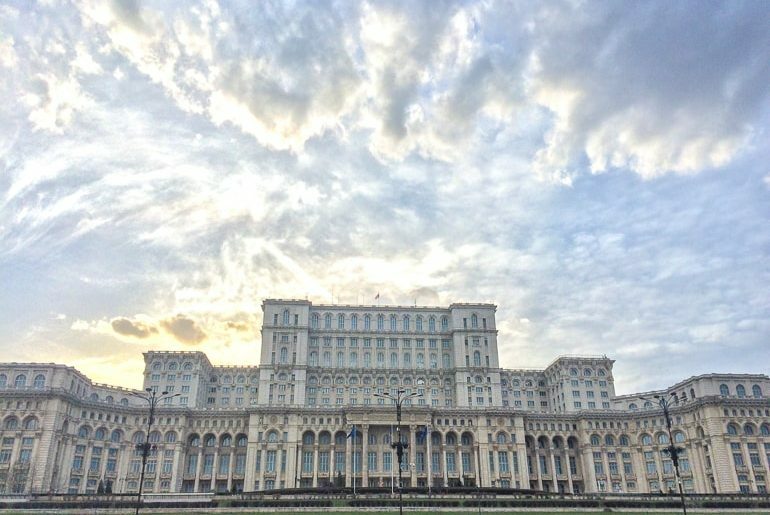 You might want to go on a Bucharest walking tour to learn all about the city’s complicated and fascinating history. If you wanted to get outside the city, Romania is known for castles. So, you could also do a classic Transylvanian castle tour from Bucharest to see Peles and the famous Bran Castle – the inspiration for Dracula’s! To start your journey: You can check here for accommodations in Bucharest and hostels in Bucharest here. We actually have a whole guide on where to stay in Bucharest if you are interested in reading. Another country in the Balkan region is Serbia – and it’s a country we have not yet been to but want to check out very badly. This is because we’ve not been to half of the countries in the former Yugoslavia and we just have Serbia, Macedonia, and Slovenia left to check out. That said, we have numerous friends who have been to the capital – Belgrade – and have had a great time. We’ve been told that the city is also very cheap – but that’s not the only reason our friends loved it. The currency is the Serbian dinar – and a pint of beer is about 1 Euro (in case you were wondering). If you wanted to learn about the city while enjoying your time in the city, you could do a retro red car Communist Tour to go in authentic style! We want to do this since learning about the history of the region interests us a lot. To start your journey: You can check here for accommodations in Belgrade and hostels in Belgrade here. From the Old Town Square, all routes lead to new adventures. You might have heard that Poland is a cheaper country to travel in – and you’d be right! We spent some time in Poland and have been itching to get back ever since. While Krakow is not the capital of Poland (that’s Warsaw), Krakow is known as the medieval city with loads of history. If you want to learn all about Krakow’s medieval history, you can join a Krakow Old Town walking tour. There’s also a giant castle on the top of a hill.. and even a fire-breathing dragon! The Polish currency is the złoty. Not only is the złoty about a quarter of a Euro, but prices are relatively cheaper when it comes to paying. We had a traditional Polish dinner at Pod Wawelem Kompania Kuflowa and it was awesome – and pretty inexpensive. The old town also had loads of bars and clubs that feature deals on drinks, if you are interested. The thing about Krakow is that there are actually very popular day and half-day trips from the city. You might look into a guided day trip to Auschwitz-Birkenau or the Wieliczka Salt Mines. We have been to Auschwitz and while it was a very heavy day, it was a good tour and great overall experience (as good as someone can have at a death camp). In any case, we wrote a guide on what to do in Krakow over 3 days if you are staying in the city. 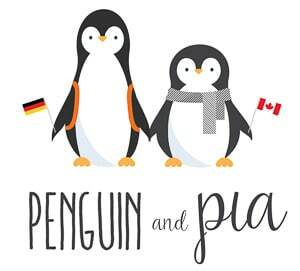 To start your journey: You can check now for accommodations in Krakow here and hostels in Krakow here. If you need more help, we wrote a whole guide on where to stay to Krakow. The view from our balcony is something we still miss so much! 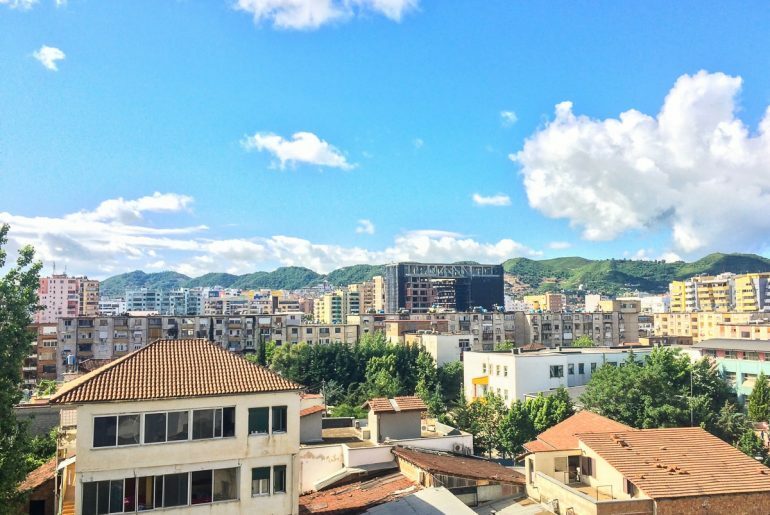 If you are looking for nice weather, friendly people, and a very cool city – you should check out Tirana, the capital city of Albania. This closed-off country has only recently become open to the world – and it’s showing its true self to outsiders who come to visit in big ways. We absolutely loved our time in Albania. We found the people to be friendly, and the capital city, Tirana, was a bustling, lively city full of colour and culture. There is plenty to do and see in Tirana in case you were worried about running out of stuff. 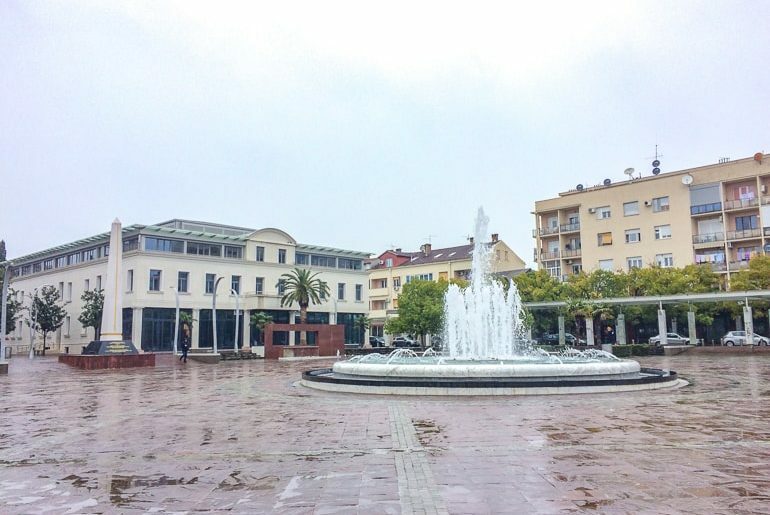 You might do a Tirana walking tour to understand the city (and the country) – we did and loved learning about the country’s struggles and triumphs. Tirana is quite easy to get to. The airport is easy to fly into – and there are taxis and an airport shuttle bus which takes you right to the city centre. As for costs, Tirana rightfully finds itself among the cheapest cities in Europe. The currency used is the Albanian Lek – and it takes about 125 Lek to make 1 Euro. The city also has a great cafe/coffee culture with many patios to hang out on. Also just so you know, one time we paid 10 Euro total for a massive dinner and drinks (and tip) where we basically had to roll home after. That’s not even an exaggeration. To start your journey: You can check now for accommodations in Tirana here and hostels in Tirana here. The Fisherman’s Bastion from across the Danube River! Oh, Budapest. If you want a cheap city getaway with loads to do and see, Budapest is for you. 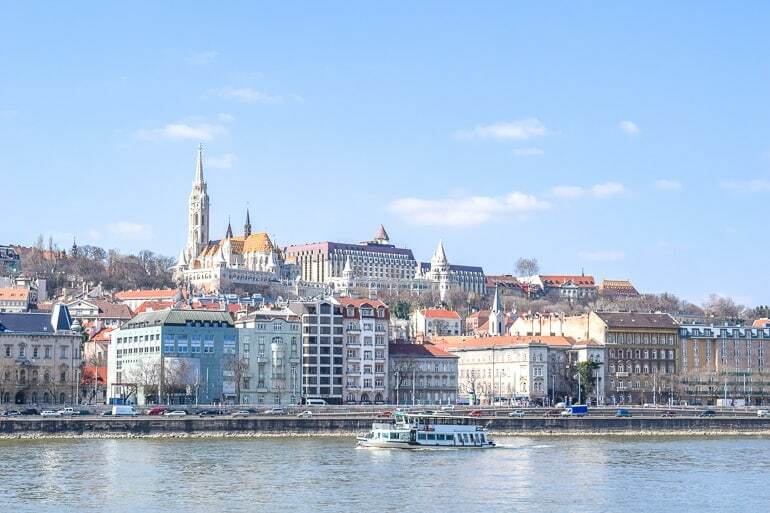 Technically speaking, Budapest might be the most expensive of the cities on this list. That said, the city is known for cheap eats, drinks, and nights out. We’ve been to Budapest numerous times now – from classic Europe trips to the times we have explored it together. Every time, the city delivers. It’s also easy to get from the airport to the city centre with the bus (100E). As for the currency used in Hungary, it’s the Forint. The denominations work in high numbers so don’t be surprised if you have to pay thousands for a dinner – it’s only actually a few Euro! It should be mentioned that Budapest CAN be done super pricey if that’s more your style – from food to activities and top accommodations. It’s ALSO easy to explore it relatively cheaply. We’re not going to dive into our knowledge of the Hungarian capital in this post since we have a massive group of Budapest posts – from where to stay to the best restaurants, cafes, attractions, and even a one-day itinerary! That said, a great welcome activity to do in Budapest to see the city is to hop on a Danube river cruise at night. To start your journey: You can get started looking for accommodations in Budapest here and hostels in Budapest here. Eric stayed in Vitae Hostel (formerly Carpe Noctem Vitae) and it was a cheap, fun Budapest experience! Independence Square is a buzzing place – when it’s not raining! Many people know Montenegro for the sunshine and the coast. Kotor and Herceg Novi are amazing seaside towns – but we think the capital is also worth a look! The capital city, Podgorica, is located in the middle of the country but only a bus ride to the Adriatic Coast. Podgorica is also nice because you can fly in easily – and a cab ride to the city was only 13 Euro. It’s actually a bit of a drive so we found this to be a fair price. Speaking of money, the currency used in Montenegro is – funny enough – the Euro. This is funny because Montenegro is not in the EU nor is it part of the Eurozone. Years ago they just decided to use the Euro and have just stuck with it! The city itself is pretty low-key but has a massive area of bars, pubs, restaurants, and places to go out and enjoy. There are also things to do in Podgorica that you might want to check out. That said, there are great places to find a good meal for cheap. We ate at Pod Volat and loved every single bite – and it only cost 18 Euro for a huge traditional Balkan meal with drinks and tip. To start your journey: You can get started looking for accommodations in Podgorica here and hostels in Podgorica here. Our stay at Montenegro Hostel B&B Podgorica was less than 20 Euro for a night (in a private room) and we loved it. The host was great, location was great, and it was cheap! When you think of cheap cities in Europe, you might not think of places in Croatia – a country known for sun, rocky blue coast, and tourism. However, once you get outside the tourist hubs (Dubrovnik, Split, etc) you can actually find some cheaper cities/towns with great food and accommodations. Rijeka is one of them! Located at the “elbow” of the country where the sea becomes Kvarner Bay, Rijeka is known for the very fact that it’s NOT one of the larger centres that everyone flocks to. In Rijeka, there’s just as much history, architecture, and sun as the other port/seaside cities in Croatia! There’s even a castle close by and it’s within driving distance of other top attractions around Croatia. The city is close to Pula and would serve as a good base for Croatia island hopping (also a great idea). You could even check it out on the way down to explore Krka National Park. The Croatian Kuna is the currency used – and it can be pretty cheap to live outside the bigger cities. We had this experience staying in the Kastela (small towns outside Split). Eating out with drinks and everything was WAY cheaper here. To start your journey: You can get started looking for accommodations in Rijeka here and hostels in Rijeka here. Read Next – Plan the Ultimate Croatia Road Trip from 5 to 14 Days! The capital city is great for exploring in any season – summer or winter! If you are travelling through the Baltics, you might not consider Lithuania first since (admittedly) Estonia is usually the first thought. That said, Latvia and Lithuania are amazing countries – and the capitals are equally awesome, full of culture, and definitely inexpensive. 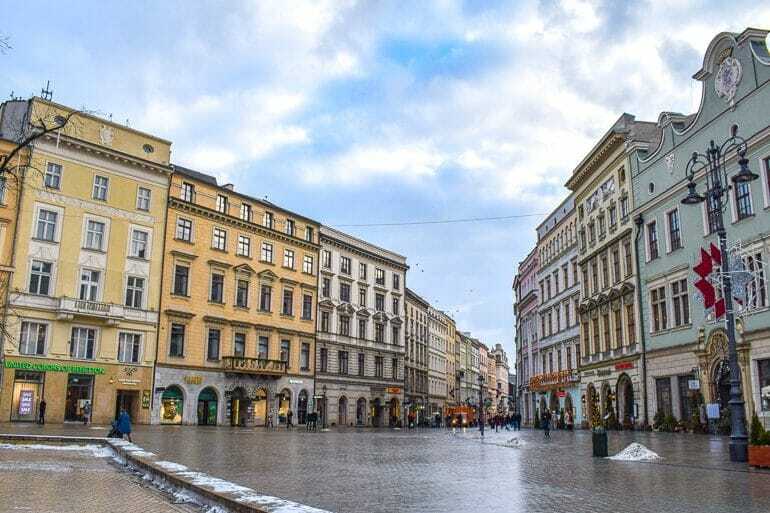 Vilnius, the capital of Lithuania is probably even cheaper than Riga! Eric travelled the Baltics – and everything from bus fare to groceries and eating out was very inexpensive. In Vilnius, Eric went to a cafe and had a nice coffee which was also not expensive. He then went out for a few beers and even joined friends for a traditional hearty Lithuanian meal and beer.. which was around 6 Euro – so pretty darn affordable. If you want to eat hearty Lithuanian/Eastern European food, then you should definitely check out a food and drink tour through Vilnius. Vilnius is also great because there’s a beautiful castle – Trakai Castle – just a cheap day trip away! Eric went and it was very cool even in the winter time – the lake region in the summer is supposed to be amazing. To start your journey: You can get started looking for accommodations in Vilnius here and hostels in Vilnius here. Eric stayed in Jimmy Jumps House and it was easily one of the best hostels he’s stayed in across Europe. The old town from up at the Bratislava Castle is a gorgeous view. People often bash Bratislava, the capital of Slovakia, for being boring, run-down, and generally “skippable”. We would disagree! Bratislava is a quintessential Central/Eastern European city with a charming old town, tons to eat and drink, a massive castle, and more. Plus, Bratislava is only an hour Flixbus ride away from Vienna (we did that day trip). If you are looking for a cheaper city, it’s certainly for you. We know from a friend that it’s got a younger vibe because of the students – and so the night scene is apparently very lively. As for prices, we had a massive traditional meal and drinks at a place close to the old town and it was inexpensive – even in Euro. Overall, Bratislava was a great European city to explore in the winter and we want to see it in the summer. You could tour the city in retro Soviet-era cars and learn about the past or you can even do a beer tour around the Old Town if that interests you! 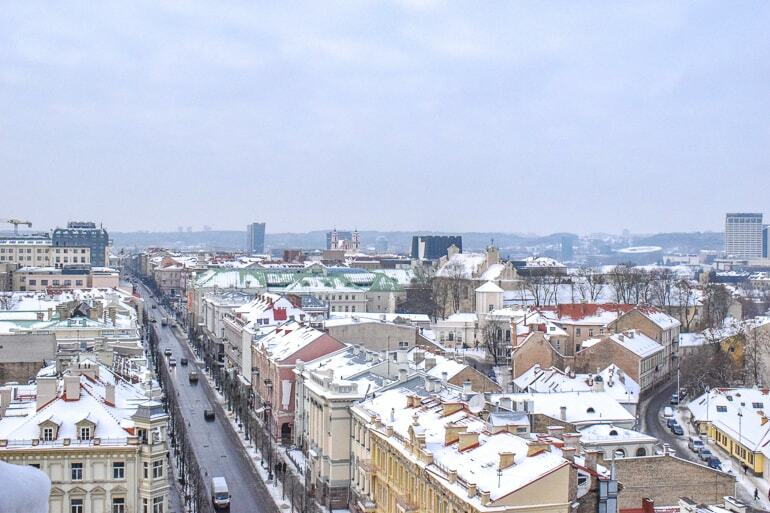 Check out Bratislava before brushing it off – you might be surprised! 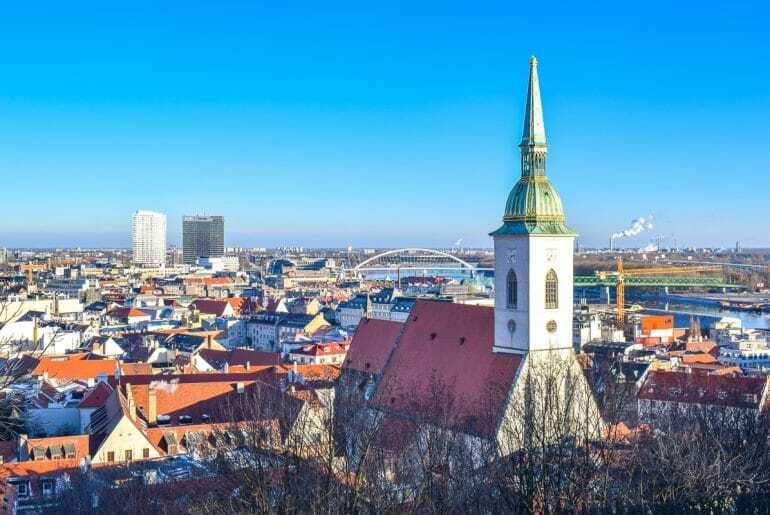 To start your journey: You can get started looking for accommodations in Bratislava here and hostels in Bratislava here. And there you have it – 10 of the cheapest European cities that you can check out. From firsthand experience, these are some great cities with so much to offer travellers. We’re honestly a little jealous if it’s your first time exploring them because it’s a feeling you can never duplicate! Guess we will just have to go back and enjoy them anyway. Let us know which ones you want to check out or loved visiting!